Also known as the Little Fire God, Shulawitsi is an important spiritual figure in the Zuni pueblo tradition. 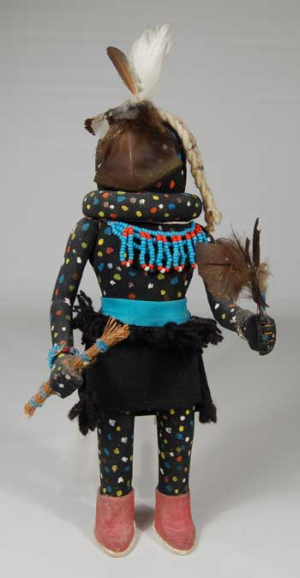 Personated by a young boy of the Badger Clan, this figure’s body and mask are painted black with various multicolored dots, and his role is to carry a fire brand during the Shalako ceremony, which marks the end one year and the beginning of another. The ceremony intends to ask the protective spirits to provide the community with rains and sustenance. The Little Fire God also carries a small deerskin bag within which are seeds to be blessed during the fertility rites that are a part of the Shalako ceremony. It is important to note the use of the word “personate” in the discussion of Zuñi and other Pueblo people’s gods and kachinas. Generally speaking, in Pueblo culture, when a dancer dons a mask for a specific ceremony, that dancer becomes the god represented by the mask, just as the mask becomes animated by the god as it is worn. Masks are sacred objects that facilitate communication and connection between man and gods. Even when not worn during ceremonial dances, masks are revered objects that are fed and taken care of by kiva societies or clans who are responsible for their well-being. These masks are believed to be vital and dynamic objects, if not sentient things. Therefore, the young boy, who spends a year preparing to wear the mask of Shulawitsi during the Shalako ceremony, does not impersonate or merely act like the Little Fire God; he actually becomes--or personates--Shulawitsi during the ceremony itself. Zuni Pueblo Shulawitsi Katsina. Photograph Courtesy of Adobe Gallery, Santa Fe, New Mexico. University of New Mexico Press: 91-113.